Our goal is to help you maintain your licenses by providing high-quality, current and practical courses in Sports Medicine. We want you to be able to acquire your CEU's in a convenient, affordable, and easy-to-use, online format. As licensed professionals, we spent many years locating and researching continuing education courses. We then had to spend money and time away from our families traveling and attending courses that made the experience less then affordable, or enjoyable. We were often rushing in the face of CEU due dates with few available options. We decided to create this site to help others in our situation to quickly and efficiently meet their needs for completing their continuing education requirements. As practicing Sports Medicine professionals ourselves, we have an in depth knowledge and understanding of the needs of others in our industry. We often could not find the high quality courses in our field that would build our knowledge of current trends and practices. 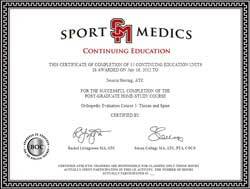 This site fills the need we feel exists in the area of high-quality, affordable, and online continuing education course work specific to Sports Medicine. Our first task was to go out and build high quality continuing education courses that would deliver relevant information is an easy-to-use, affordable format. Our courses were created using coursework and information from the highest quality, respected industry publications, studies, speakers and experts in the fields of Sports Medicine. Topics include General Medical Conditions, Injury Prevention, Injury Evaluation, Emergency Medical Care, Sports Specific Training & Rehabilitation, Nutrition, Psychosocial Issues in Sports, Theraputic Exercise and sports in special populations.